Wow wow wow wow wow! I am still reeling over this book! I don't know if it is because I am not used to reading contemporary fiction (I seem to have a nice stack of vampire, werewolf, faerie, pixie, you get the idea ... books in my room), but I ADORED this book. I am a huge fan of Jane Eyre- so underloved. I was drawn to this book because of the cover- the moodiness of the gray and the sad girl, countered by the hot pink JANE across the front. I wasn't sure how I would like this book. I knew it was based on Jane Eyre, but come on... a rock star? Well, I am sold! 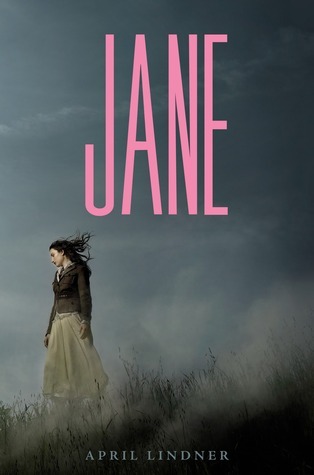 This is the kind of book that you know what is going to happen next- I mean, it is based off of Jane Eyre! I couldn't wait to find out how the author was going to work in the crazy wife, the fire burning down the mansion, and Jane running away. This book was like a giant piece of chocolate cake- I couldn't keep my hands off of it! I found myself re-reading the last few chapters over and over just so the book wouldn't end. It is the kind of book that I find myself daydreaming about. April Lindner- you have a new fan. I really liked the original, and I am always hesitant to read spin-offs...but your review has convinced me I should check this out. So, needless to say, this book definitely peeks my interest since it's based off of Jane Eyre. The whole rock star thing didn't phase me. I guess when retelling, you have to change it up somehow. I'm really excited to read it now. Awesome review!